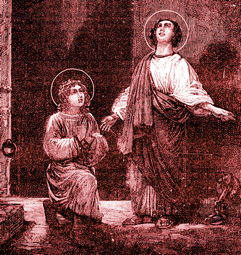 There lived at Nantes an illustrious young nobleman named Donatian, who, having received the holy Sacrament of regeneration, led a most edifying life and strove with much zeal to convert others to faith in Christ. His elder brother, Rogatian, was not able to resist the moving example of his piety and the force of his discourses, and desired to be baptized. But as the bishop had departed and concealed himself during the persecutions, he was not able to receive that Sacrament. Nonetheless, he was shortly afterwards baptized in his blood, for he declared himself a Christian at a time when to embrace that sacred profession was to become a candidate for martyrdom. Donatian was sought, first for professing himself a Christian and for having deterred others, particularly his brother, from worshiping the gods. He was apprehended, and having boldly confessed Christ before the governor, was cast into prison and loaded with irons. Rogatian was also brought before the prefect who endeavored first to gain him by flattering speeches. Finding him inflexible, he sent him to prison with his brother. Rogatian grieved that he had not been able to receive the sacrament of Baptism. Donatian prayed for him that his faith might procure for him the effect of Baptism, and the effusion of his blood that of the Sacrament of Confirmation. They passed that night together in fervent prayer. The next day they were summoned again by the prefect, to whom they declared they were ready to suffer for the name of Christ, whatever torments were prepared for them. By the order of the inhuman judge they were first stretched on the rack, afterwards their heads were pierced with lances, and finally cut off, about the year 287.